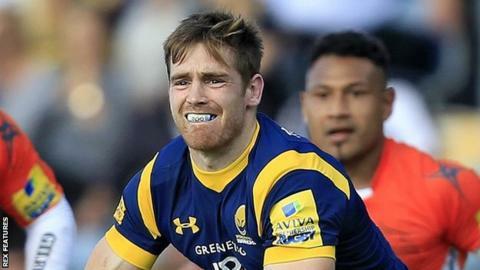 Worcester fly-half Tom Heathcote says new saliva concussion tests will help remove a "grey area" in rugby. Premiership and Championship players will take part in the development of a new pitch-side test to try to better diagnose concussion this season. Heathcote, 25, missed a large part of the 2016-17 season through concussion. "I think it's a massively positive step: anything that can give a stronger indication if a player is ready to play is positive for welfare," he said. Alongside the existing Head Injury Assessments, this season players will provide saliva and urine samples after studies showed they could provide a swift indication of head injuries. Those suspected of suffering head injuries will provide saliva and will give follow-up samples as they go through the return-to-play protocol - these will then be compared to samples from those who did not suffer head injuries. Last season Scotland international Heathcote completed the return-to-play protocol after suffering concussion, only to be "brought back to square one" by another knock to the head upon his return. Concussion accounts for 25% of all injuries in rugby and Heathcote believes the latest step being carried out by the University of Birmingham is an important one. He told BBC Hereford and Worcester: "For players coming back from concussions it's an extra layer of confidence when you return to play, especially if it's a second or third concussion in a season, as was the case with me last season, where perhaps you want a little bit more proof that you are 100%. "Before, there has been a little bit of a grey area in the essence that you do all of your return-to-contact stuff when you're symptom-free. "But until you get a large shock that rattles your head you don't really know [if you are 100%] because it's difficult to put yourself in that situation in training. "I had a big contact, and even though I felt OK and passed the return-to-play protocol, it could have been the case that if I'd waited another couple of weeks then the second concussion might not have happened."